When it comes to produce, sometimes we just don’t know what we’re missing. A recent Vox article by Julia Belluz makes the case that produce tastes better in Europe because Europeans demand it. Their priorities when buying produce center on flavor rather than appearance. In America, farmers focus more on growing and shipping produce that is durable, gives a high yield, and matches a certain culturally expected look. We don’t demand better flavor in America because most of us don’t even know it exists. Instead, we associate the quality of our produce with how it looks and feels. “Most Americans are stuck with massive, perfectly red, eminently tasteless tomatoes,” writes Belluz. At the same time, a lot of healthy and flavorful produce goes to waste simply because it might look a little different or weird. Farmers often don’t even ship it. Just like with people though, it’s very rare that two pieces of produce naturally look exactly the same, but that doesn’t necessarily mean there is anything wrong with them on the inside. At GoodFarms there are several times during the year when our organic strawberries increase in flavor and nutrition. The only problem is that they also decrease in size at the same time. This can cause people to not want them because they don’t seem to be the right size. All the while, they don’t know the wonderful flavor they are missing. 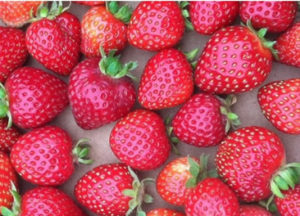 By selling these berries, we reduce food waste while also wowing our customers with flavor. So the next time you’re at the store and you see some produce that maybe looks a little different, think about giving it a try. You could be pleasantly surprised.